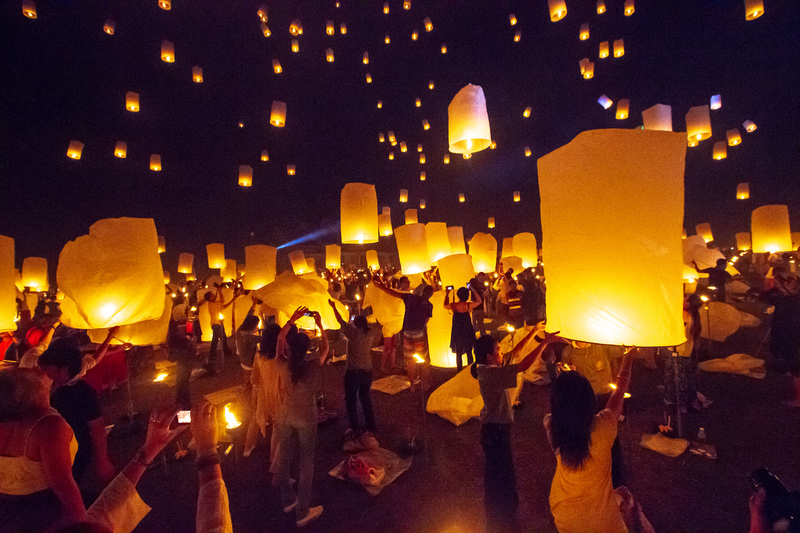 The Lantern Festival in Chiang Mai is one of the most magical and beautiful festivals held in Asia, indeed anywhere in the world. Serendipitously I had arrived in Chiang Mai, the former capital of the ancient Lanna Kingdom, which one of the world’s largest paper lantern shortly before they were to begin. The images I had seen in travel magazines and on television seemed almost other worldly; rivers alive with floating rafts of incense, candles and flowers; skies filled with glowing lanterns. I had no reference point. It was to be a feast for all senses. Having already relished Loi Krathong at in Chiang Mai I was looking forward to Yee Peng with great anticipation. During Loi Krathong there were many lanterns over floating in the skies over the ancient moats of old town but as it turns out this was just whetting my appetite for more. A friend told me about the Yee Peng celebrations at Tudongkhasathan Lanna, a Buddhist community about twenty minutes outside of Chiang Mai and I was excited. Seems that this is the largest simultaneous paper lantern release in the world! People travel from all over the planet to witness this spectacle and here it was, happening in my new backyard. The evening began with a “Kantok” or a meal that represents the hospitality of Lanna people. It is considered a way of honoring guests and there were many. There were also representatives of the many hill tribes that our host Yeepeng Lanna International helps and performances put on by traditional dancers. The food was different than the usual Thai food I had eaten before. Fried banana, a mouthwatering pork curry and a delicious Green Chili Pepper Dip (Nam Prik Num) were just a few of the delicacies that we got to enjoy at tiny community tables placed directly on the ground. It was a feast; very convivial, light-hearted and it was obvious much respect flowed from our hosts to us and it was gratefully returned. After the meal, we entered the park where the ceremonies and the lantern release would be held. It was just starting to get dark and a pretty surreal scene. 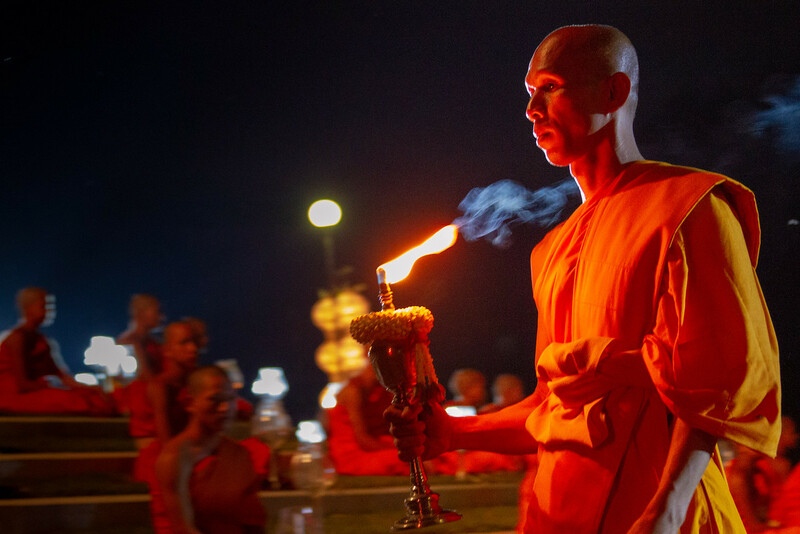 The grounds were filled with torches, the aroma of incense was on a very light breeze and saffron-robed, chanting monks and novice students were everywhere. At the far end of the grounds was a raised mound topped with a golden Buddha. 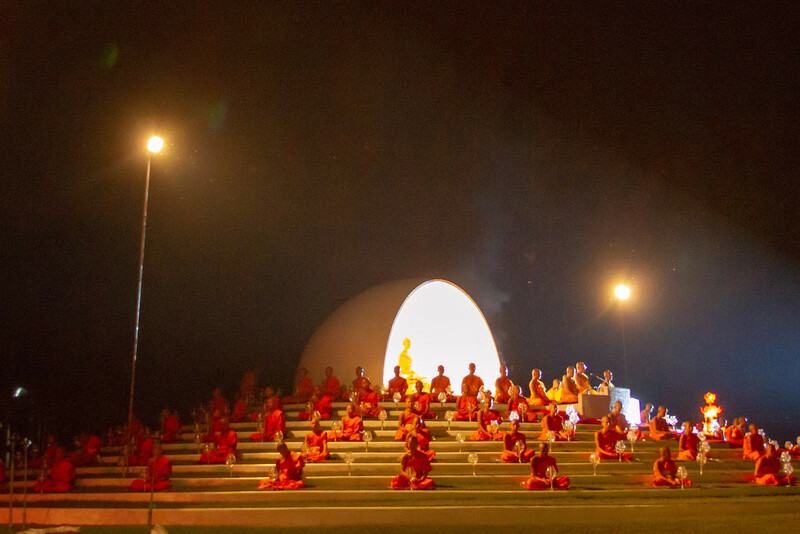 The mound was also covered by evenly spaced monks meditating in the waning light. There was much activity but the atmosphere was very warm, calm and inviting. Everyone talked almost in whispers. At one point the head monk-led more meditation, in English and in Thai, and a walking circumambulation of the grounds and the raised mound. It was beautiful. I had a hard time balancing making photographs and just soaking everything in. When it was time for the main event thousands of floating lanterns (khom loi) were distributed by the novices to the gathering. The lanterns themselves are made of a white craft like paper with wire rings inside to hold them open. They are distributed flat but easily expand when ready for use. 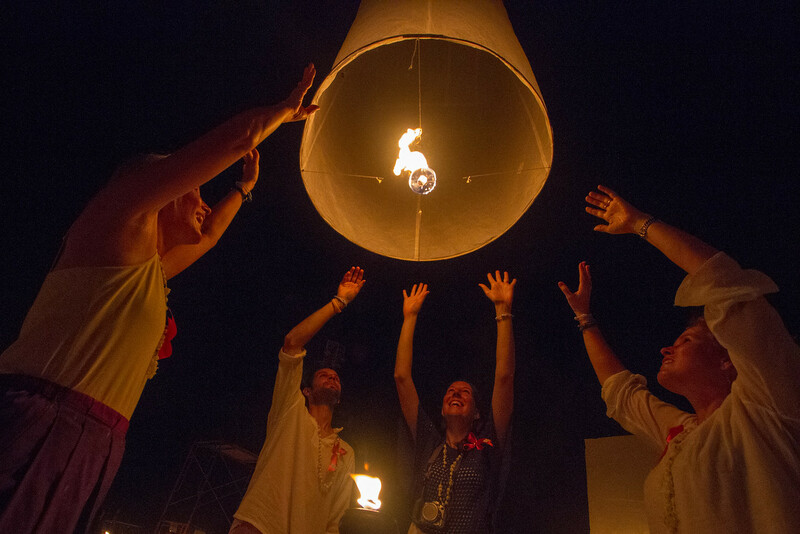 There is a wax ring mounted at the bottom of the contraption that is lit as a heat source to raise the lanterns into the sky, like hot air balloons. Assembly went rather quickly with veterans helping newbies get started. When a signal was given a huge wave of lanterns was released and the dark skies filled with what looked like internally lit, huge, warmly glowing schools of floating magical jelly fish. The lanterns were big, close to a meter across at the base, but they quickly floated skyward where they appeared to mingle with the stars. This continued as wave after wave of lanterns were released. There was a real sense of community and shared emotion filled the air. Traditionally these lanterns are released to bring good luck, merit and to float problems into the skies and carry them away. I am not sure if this actually works but there was definitely a very spiritual aspect to the meditation, the release and indeed the whole evening. Even while witnessing the spectacle I felt lighter, more carefree and totally unable to wipe the huge goofy grin off of my face. I was reminded that what few problems I have in my life are tiny inconveniences when viewed next to the grandeur of and enjoying a simple life well lived. Thanks Tracy! It was one of the most beautiful things I have ever experienced! And you Gigi. There is plenty of room out here for everyone who choose to experience it.